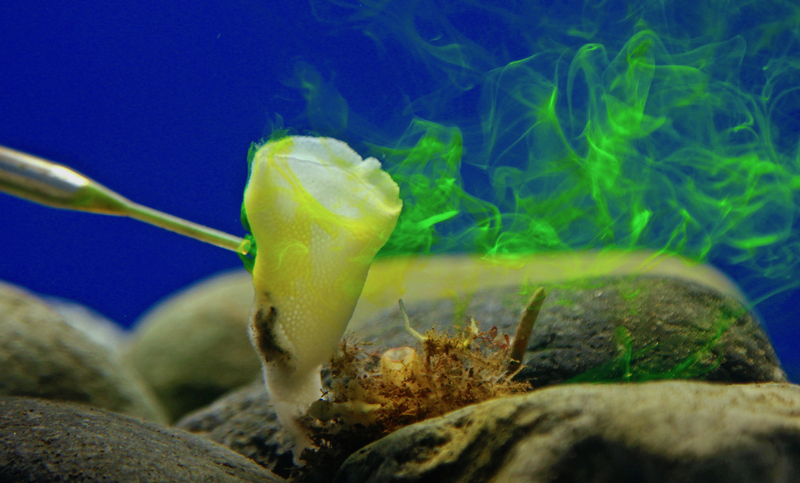 Fluorescent dye, used to monitor how quickly glass sponges filter, swirls in magical patterns through the tank. Beneath the surface of the sea along B.C.’s west coast lies a city of living, growing glass. Towering up to 20 metres above the murky darkness of the sea floor, glass-sponge reefs are delicate twisting structures of silica. Their shapes vary from maze-like branches to billowing cauliflower-like clouds. Until now, nobody had been able to keep the sponges alive long enough for meaningful study. However Angela Stevenson, a biologist at the University of British Columbia, has pioneered research on glass sponges that are flourishing in her lab – apart from those she has subjected to heat and acid to test their resilience. That has impressed other researchers. Her results so far raise serious questions as to how climate change will affect the sponge’s essential role in B.C’s marine ecosystems. 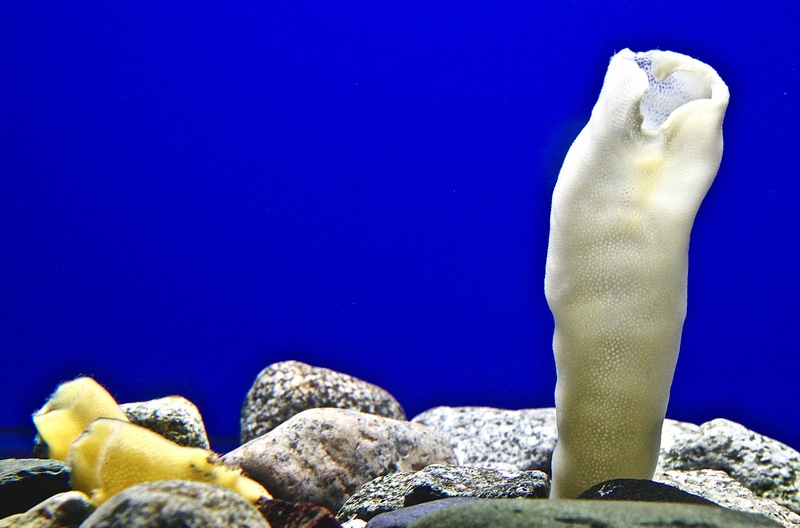 Warming sea temperatures appear to be dramatically weakening the sponges’ filter-feeding abilities, which are essential to local food chains. All the animals above the sponges in the food chain could be impacted should her laboratory results be replicated in the wild, as sea temperatures and composition change. Because of Stevenson’s research, biologists now have the means and the motivation to learn more about the mysterious sponges and their importance to other species. Individual sponge gardens can be found across the world, but B.C.’s expansive glass-sponge reefs are the last known on earth. It wasn’t until 1986 that scientists even realized the reefs existed in Hecate Strait, which sits between Haida Gwaii and the mainland in northern B.C. They were thought to have disappeared in the Jurassic period 40 million years ago. Glass sponges live their lives constantly pumping water through their glassy structures, taking bacteria and other small particles out of the water to use for growth. These chimney-like tubes start by drawing in water through the pores lining their walls. Sperm-like cells fixed to the inner walls then shuffle the water and food up to the top using protein whips. Other cells grab and eat the microorganisms floating through the water and, at last, clean water is pumped out of the top. By doing so, they’re filtering the water for the entire ecosystem. Even Stevenson’s little laboratory sponges are ravenous filtration machines. “Imagine drinking 72 one–litre cartons of milk in one hour, and that’s one little sponge,” Stevenson said. Stevenson said this feeding process is key to B.C.’s marine environment, beyond the sponge structures providing habitat for other animals. “They’ll filter the Howe Sound in one year – the entire body of water,” Stevenson said. 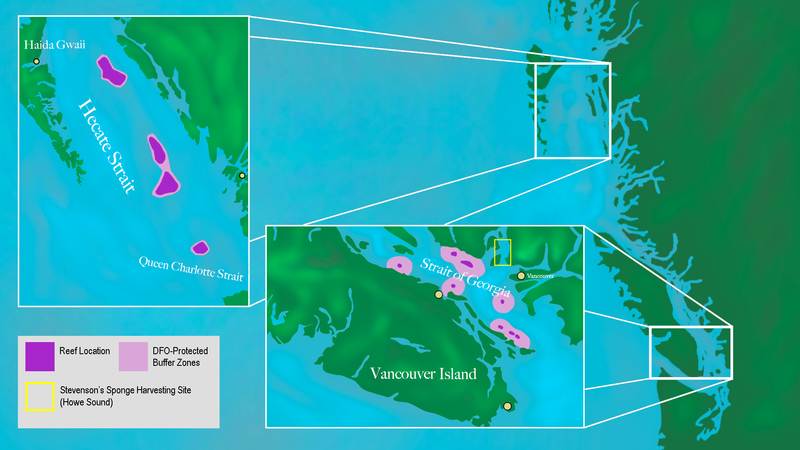 Map showing location of B.C.’s glass sponge reefs. Stevenson spent almost three months, full-time, figuring out the best set-up for these fragile animals. So she decided to try feeding them a liquid diet. “But it’s really through sheer determination and hard work,” said Stevenson. Stevenson’s success has not come without a tremendous amount of time and effort. 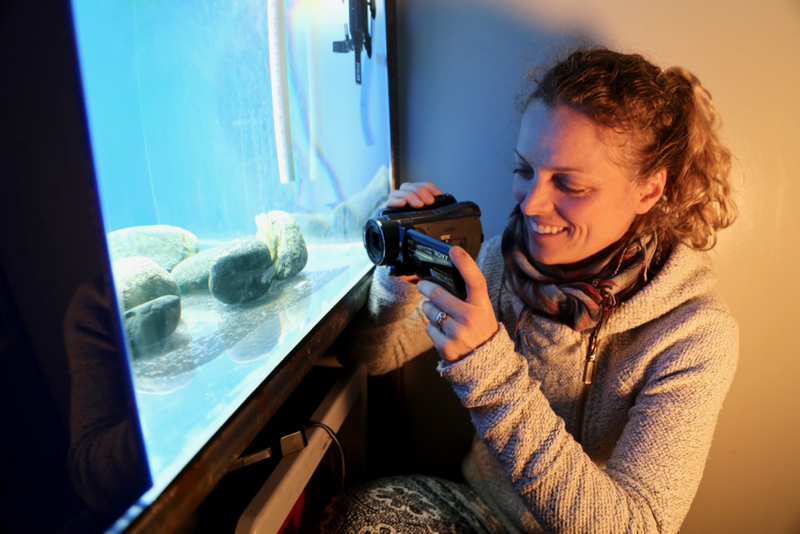 She spends 12 hours a day, seven days a week, in the UBC lab looking after the sponges. Angela Stevenson films her glass sponges to see how quickly they filter a fluorescent dye. That commitment is something other sponge researchers admire. “No one else to my knowledge has dedicated so much time and commitment to this simple task of just trying to keep them alive,” said senior research scientist Jeffrey Marliave of the Vancouver Aquarium. He’s been a glass-sponge researcher and enthusiast for decades. “We have failed so resoundingly, so repeatedly,” Marliave said. Being able to study sponges in the lab is vital if scientists are to find answers as to how they work and their role in the wider ecosystem. The oceans make for an extremely complicated study environment because factors like temperature and acidity are always in flux. Sponges are particularly frustrating to study during research dives because they’re constantly changing form. “They’re like shapeshifters,” Marliave said. Researchers like Marliave have to put bar-coded stakes into the reefs, so that they can tell what they’re actually looking at from one season to the next. Studying animals in the lab, like Stevenson has, gives researchers control over their animals’ environment. The temperature and acidity of water, in this case. “If we can’t keep them in the lab, we can’t do experiments on them,” Stevenson said. As climate changes increase the heat and acidity of the world’s oceans, it’s up to scientists to determine how the glass sponges and their ecosystems could be affected. “I think we often think of climate change as affecting tropical reefs,” said Jessica Schultz, manager of the Vancouver Aquarium’s Howe Sound research and conservation team. The sponges live their lives fused to rocks deep in the ocean where conditions are relatively stable. This means they’re more sensitive to environmental shifts. Cloud sponges in Stevenson’s UBC lab. Stevenson has been testing the sponges’ resilience by placing them in warmer and more acidic water. Her preliminary results indicate that, when the water is warmer, the sponges are filtering water two to four times more slowly and the process is much less effective. Compounding heat with acidity makes it even worse. “If they’re stressed for too long, as it is with us, things start to break down,” Stevenson said. Stevenson’s research on how climate change might affect the glass sponges is forthcoming, but the ramifications on the ecosystem remain to be researched. “You can imagine if they’re removing bacteria, viruses, protists, any small particle in the water – what if that just starts to build up?” she said. Changes in water composition are likely to have implications for other species on both land and sea. “Whatever impacts the ocean, anything living in the ocean, will impact us,” said Stevenson. This preliminary research on how B.C’s glass sponges might respond to rising temperatures comes at a time where government commitments to tackling climate change are being questioned. In February, B.C. Auditor General Carol Bellringer admitted that B.C. was not on track to meet its interim targets of reducing greenhouse gases by 33 per cent below 2007 levels by 2020. That’s why climate change is a major concern for researchers like Stevenson.